According to BBC News, George Clooney is to produce the film version of Tracey Letts’ play, August: Osage County, which will star Meryl Streep and Julia Roberts. The play, about a dysfunctional family brought back together after their poet father disappears, won the Pulitzer and the Tony awards for best drama in 2008. Streep and Roberts will play mother and daughter in the film. “It’s such a terrific group and we feel honoured to help bring it to the screen,” said Clooney in a statement. The Weinstein company is backing the movie adaptation, while John Wells is directing. Wells is best known for his TV work including ER, Mildred Pierce and the US adaptation of Shameless. And Clooney will be joined by co-producer Grant Heslov, who was also behind the star’s previous films The Ides of March and Good Night and Good Luck. “Grant and I are thrilled to work on this project… I can’t think of anyone better than Harvey to put this all together,” Clooney continued. 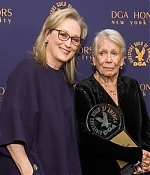 Weinstein returned the compliment: “George and Grant are gifted producers, with great taste and instincts, and a work ethic that is second to none.” Streep will play a matriarch who is addicted to prescription drugs, while Roberts will portray her eldest daughter Barbara. The play made its Broadway debut in December 2007 after premiering at Chicago’s Steppenwolf theatre earlier that year. The rest of the cast has still to be announced. Shooting will begin in the autumn. There’s news on the big screen adaptation of “August: Osage County” – although it’s pretty much what has been known already. Theater buffs have been curious for a while now about the cinematic fate of “August: Osage County,” Tracy Letts’ 2008 Pulitzer Prize-winning family drama that has been in development as a movie for several years. Now the film project – which would have Meryl Streep as pill-popping matriarch Violet Weston and Julia Roberts as her complicated adult daughter Barbara – looks to finally be taking a step forward. An executive at the Weinstein Co., which owns rights to and has been developing the movie, said that a September schedule-opening for both Streep and Roberts could allow the movie to begin shooting in the fall. The executive, Weinstein Co. COO David Glasser, said the goal was for the film to wrap production by the end of 2012 and come out in the 2013 autumn awards season. According to another person at the company who asked not to be identified because they were not authorized to talk about internal matters, Letts, who had been adapting his own play for the screen, recently turned in his screenplay to the company and executives deem it close to shooting-ready. The complete article can be read at the Los Angeles Times, a second article has been published by Cinema Blend. Let’s see how this develops. Thanks to Glenn and Frank for the heads-up! In a recent interview with ComingSoon to promote his latest film, “The Company Men”, director John Wells dished on his next project, the adaptation of Tracy Lett’s stage play “August: Osage County”. We’re gonna do the Tracy Letts play “August Osage County.” It’s a film for Weinstein. It’s been in the press already, so it’s not a secret. Julia Roberts and Meryl Streep look like they’re gonna do it, so and I’ll direct that next fall I think, so I’m working with Tracy on the screenplay now. It’s a great play, and we’re trying to turn it into something less than a four-hour movie. It was a long play. Today has brought two big updates for Meryl’s potential next project “August: Osage County”. First, Hollywood Elsewhere has the scoop that the film will “reportedly begin filming next summer (presumably between May and August), or a month or two after Streep finishes portraying conservative British prime minister Margaret Thatcher in Phyllida Lloyd’s The Iron Lady.” Then, Julia Roberts has talked to Entertainment Weekly and was asked about the project. Q: Your next movie is August: Osage County with Meryl Streep. Could that be your return trip to the ceremony? A: I think that will just be my trip to heaven to be with Meryl Streep in that scenario. It’s a dream come true. I think this project can be treated as official from now on ;-) “August: Osage County” is a darkly comedic play by Tracy Letts. When the large Weston family unexpectedly reunites in Oklahoma, after their father disappears, their home explodes in a maelstrom of repressed truths and unsettling secrets. This new play unflinchingly – and uproariously – exposes the dark side of the Midwestern American family. Meryl Streep is cast in the role of the mother and family matriarch of the Weston family, Violet. She is addicted to several prescription drugs, mostly depressants and narcotics. Julia Roberts is cast as her oldes daughter, Barbara.